A large and dramatic composite 1794 map of the world as it was known to the ancients, by J. B. B. D'Anville. Covers all of Europe, Asia Minor, Arabia and India, much of Northern Africa, and parts of Southeast Asia. 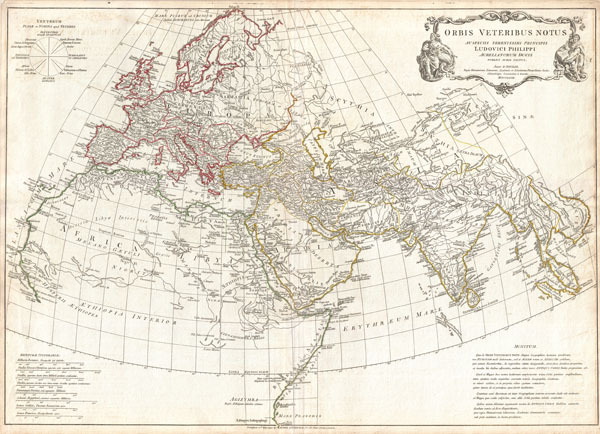 D'Anville compiled this map from various sources including Ptolemy, Herodotus, Thucydides, and others. In Africa, the author notes various cities from Ptolemy's Geographica, including Rapta, Axum, Garama, and others. Includes the Mountains of the Moon, Lakes of the Nile, and other conjectural destinations. Far in the south a note reads, 'Aethiopes Anthropophagi,' which essentially translates to African Cannibals. In the Far East a number of classical locals are noted, including the island of Taprobana (Celon) and the empires of Southeast Asia. Details mountains, rivers, cities, roadways, and lakes with political divisions highlighted in outline color. Title cartouche appears in a baroque frame in the upper left quadrant. Cartouche is flanked on either side by malignant appearing figure with a telescope and a studious scholar reading a book. Includes eight distance scales, bottom left, referencing various measurement systems common in antiquity. Text in Latin and English. Drawn by J. B. B. D'Anville in 1762 and published in 1794 by Laurie and Whittle, London.